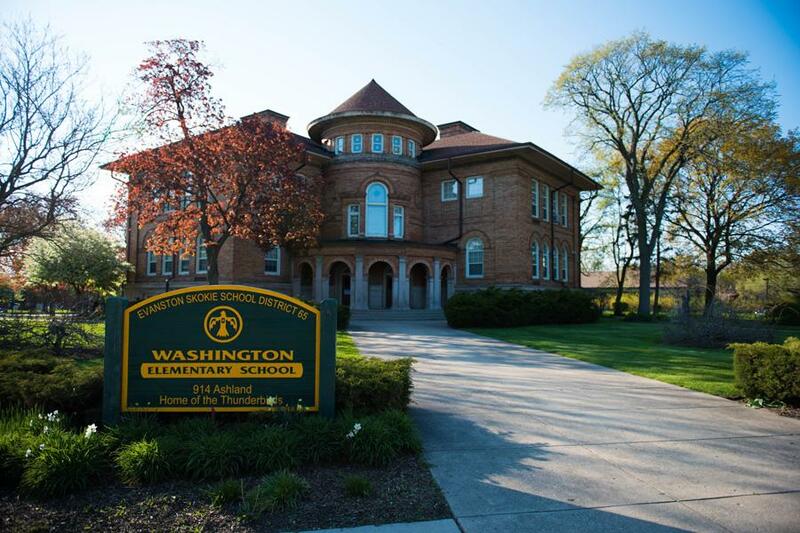 Washington Elementary School, 914 Ashland Ave., is one of ten elementary schools in Evanston/Skokie School District 65. The Evanston/Skokie School District 65 Board of Education is considering placing a referendum on April’s ballot that will impose a $14.5 million tax increase. The Evanston/Skokie School District 65 Board of Education will vote next week on whether to put a property tax referendum on the municipal ballots in April in the face of potential million-dollar cuts to district funding. The referendum, which would bolster operating funds if approved, will ask voters to approve a $14.5 million tax increase that would go to reducing the district’s upcoming deficits. Board President Candance Chow said if the referendum was not approved, the district would have to make $8.8 million in cuts in the next two fiscal years. The district’s deficit would grow to a cumulative $114.4 million from fiscal years 2018 to 2025. Chow said cuts would most notably lead to increased class sizes, as the mounting deficit would potentially lead to staff reductions or school closures. At a finance board meeting on Dec. 5, District 65 Superintendent Paul Goren said the district had expanded in enrollment, and its budget, in recent years. At the same time, tax caps limit the district’s revenue growth. According to board documents, the average property tax paid by Evanston residents is about $8,000 per year. If the resolution is approved, that would increase by more than $450 per year. Goren said although they would have to make some cuts no matter what, they were trying to sustain the district’s level of programming and education with the additional funds that could be levied if the referendum is approved. At a board meeting on Dec. 19, Goren voiced his support for the $14.5 million referendum. According to a presentation at the board meeting, the district would likely have to make a combined $8.8 million in cuts in fiscal years 2018 and 2019. Chow said the board would plan for potential cuts in the next few months before the referendum vote. The board document indicates that if the referendum fails, there will be staff reductions in all positions, as well as a likely increase in class sizes and a reduction in programming. Chow said there will likely be several rounds of cuts if the referendum is not approved. “The cuts that we have made thus far have been as far away from the classroom as possible, and there really isn’t anything much less to do that will not impact service delivered to the classroom,” she said. Chow said the board had been discussing a referendum for about two years, but the current “dire” financial situation made it a priority.